Because studies have proven that secondhand smoke is harmful to the people and pets exposed to it, New York City has some of the toughest smoking laws in the United States. 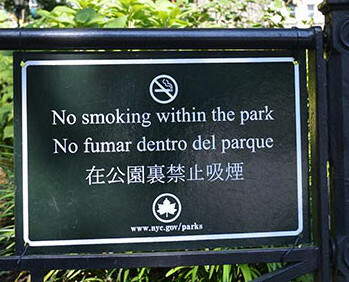 For the sake of visitors to our fare city who also happen to be smokers, here is a list of places you can and cannot smoke in New York City which was compiled in May of 2016. It is illegal to smoke cigarettes, cigars, pipes, water pipes, hookahs and electronic cigarettes in the following areas in New York City. On city sidewalks but not within 15 feet of any entrance or exit to a health care facility. These laws are not in place to punish smokers. In this country, you have a right to smoke or not smoke, but they are in place to protect the health and well-being of those who have to breath air around smokers. Since we natives enjoy sharing our city with anyone who visits (ok, most of us enjoy it), you should really quit smoking so you can stay healthy and visit New York City again and again.